Medicare Math Problem: Taxes - Benefits = Trouble An average 66-year-old couple kicks in about $100,000 in Medicare taxes over the course of their lives. They've paid in, so they expect Medicare to pay out. — and it does, to the tune of $300,000, on average. So how did the system become so unbalanced? U.S. Rep. Paul Ryan, R-Wis., right, hears from a constituent during a "listening session" Tuesday at Gateway Technical College in Kenosha, Wis. Ryan's plan to fundamentally restructure Medicare and cut social safety net programs has proved to be a tough sell to many Republican voters the last few weeks. At age 78, Milton Jones feel like he's earned his Medicare benefits. "I imagine so," he says. "I paid taxes all my life." Today, Jones is retired. He volunteers and calls bingo once a week at his local community center. But for 30 years, he worked in Pittsburgh's steel mills. "I'd mostly run a 983-Caterpillar," he says, "and I'd clean up the molten slag after the the ladle ran over." It was hard, hot work. And Jones — like many seniors his age — says because he's paid in, he's earned the benefits Medicare pays out. In Seattle, 68-year-old retired librarian Diane Rosolowsky qualified for Medicare shortly after a traumatic brain injury. She was grateful for the benefits she received. Years earlier, when she helped run her husband's veterinary clinic, she told employees who scoffed at Medicare tax deductions on their paycheck, "'That's your prepaid medical care for when you are a senior citizen!' "
And in Brookline, Mass., 86-year-old Elane Shapiro says she didn't have to struggle with medical bills after her husband died and she was diagnosed with cancer. "I was taken care of. I've always paid my taxes." she says. "I think most people feel the way I do. If anyone talks about changing Medicare, we get very nervous." 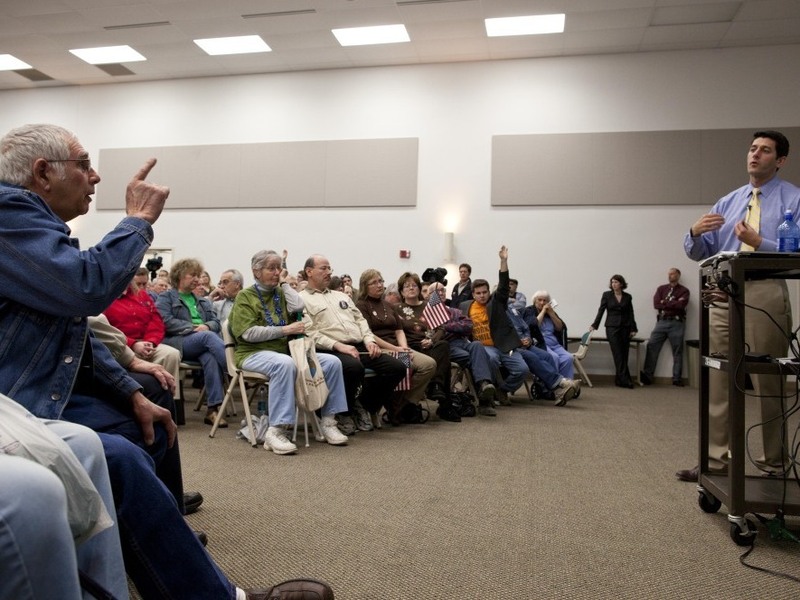 Some seniors get more than nervous, as U.S. Rep. Paul Ryan learned in a town hall meeting in his home state of Wisconsin this past week. "Hey, c'mon!" Ryan told an increasingly hostile crowd. "If you're yelling, I just want to ask you to leave." Ryan is the Republican point person for budget reform in the House. And Democrats are painting his plan as as an attack on Medicare, even as some Senate Democrats support a bipartisan plan that includes cuts similar to Ryan's. There's a reason system current system is unsustainable, says Eugene Steuerle, a former Treasury Department official and senior fellow at Washington's Urban Institute. He boils it down to two simple numbers. "An average couple retiring today has paid just a little over $100,000 in Medicare taxes" over the course of their working lives, Steuerle tells Guy Raz, host of weekends on All Things Considered. And what do they receive? "About $300,000 in benefits" — even after adjusting for inflation. How did the current system become so unbalanced? It has to do, Steuerle says, with the way Medicare was built to work — by passing on an individual retiree's health care costs to the wide pool of current taxpayers. "The incentive for me as a consumer to worry about the cost isn't very high," he says. "But the incentive for providers have this incentive to keep listing as many services as possible. The more services the hospital can list, the more they can collect." A system like that works all right if health care costs stay low. But over the past few decades, they've risen dramatically. There are more and more people entering the Medicare system. Those people live increasingly longer lives. And most importantly, Steuerle says, no one is in charge of saying "no" to medical-cost inflation. The result is a Medicare system that only pays for one third of itself. The shortfall is made up — in part — from other sources of revenue. "It's also borrowing from China and Germany and a lot of other countries," Steuerle says. That average, 66-year-old couple Steuerle talks about didn't really pay taxes for their own Medicare benefits, he says; they paid for their parents'. That's the way the system works: Current taxes pay for the benefits that go to current Medicare recipients. But say demographics shift, health care costs rise. and fewer children are born to pay into the system. Then, the child-to-parent cost chain breaks down. "Suppose you have a household with three children," Steuerle says. Those children pay for their parents' health care. But if those three children only have two children? "To what extent does that mean I am entitled — from my children — to have all my health costs covered?" he says. Stephanie Rennane, a research associate and colleague of Steuerle's, represents the generation struggling with that question. She's 25. "If I talk to my friends, other people who are 25 right now, they say, 'Forget [Medicare]; it's not going to be around for us.' "
And bringing that system into balance, Steuerle says, is going to cost all of us. "I don't see any way we can exempt any broad portion of the population from tackling our broad budget issues," he says. That could mean higher taxes for everyone — including people currently on Medicare. And possible cuts to the program. "But when we're talking about cuts in things like health care and elderly support programs," Steuerle says, "we're basically talking about cuts in a rate of growth." Health care, in other words, is always growing. If it's going to grow by $100 billion next year but is trimmed to grow only by $80 billion, that's still called "a cut." "So the language can be very misleading," Steuerle says. A rate of sustainable growth is the real goal of any sensible Medicare reform proposal, he says. "That doesn't mean that your children aren't going to get more health care in the future. They are — partly because we're going to invent a lot better things to provide them with," Steuerle says. "It just means the rate of growth that we now promise is totally unsustainable."